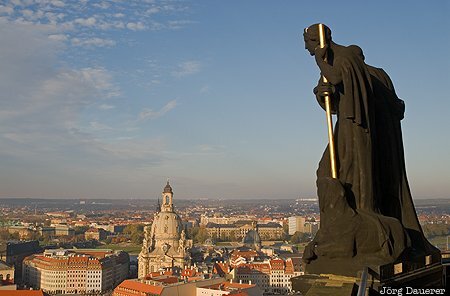 Downtown Dresden with the dominating cupola of Frauenkirche in the middle and a black statue at the right seen from the tower of Town Hall. Dresden is the capital of Saxony (Sachsen) in the east of Germany. This photo was taken in the afternoon of a sunny day in October of 2010. This photo was taken with a digital camera.